The A.P. Apologizes, Admits To A "Misunderstanding Of YouTube Usage"
My post yesterday about the Associated Press going after one of its own affiliates for embedding videos from the A.P.’s own YouTube channel on its Website caused a bit of a dust-up. As I noted in an update to the original post, the A.P. is now backing down and apologizing. It will allow the videos to go up again. 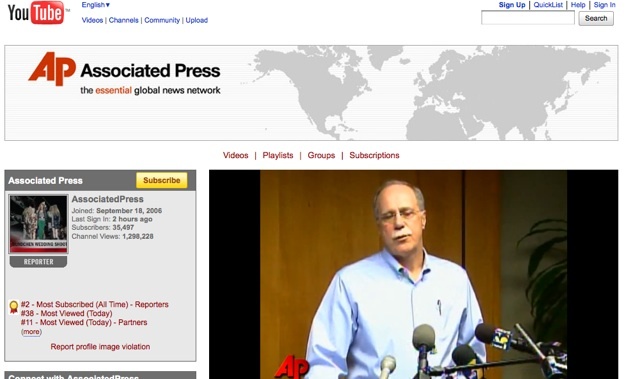 There was a misunderstanding of YouTube usage when the Tennessee radio station was contacted by the Associated Press regarding the AP’s more extensive online video services. No cease and desist letter was drafted or sent by AP to the station at any time. The AP was trying to offer the station a superior service for their needs. In other words, at the same time it was threatening the radio station it was trying to convince the station to use its “more extensive online video services,” (that would be OVN), when all the radio station really needs is what the A.P. already makes available on YouTube. At least they apologized.